So the Lake District is now a Unesco World Heritage site! Great! What were they thinking? This is clearly a misguided decision that will only serve to clutter the area up with even more disappointed tourists. I therefore feel that it's my duty to try and redress the balance with a truthful account of the region. 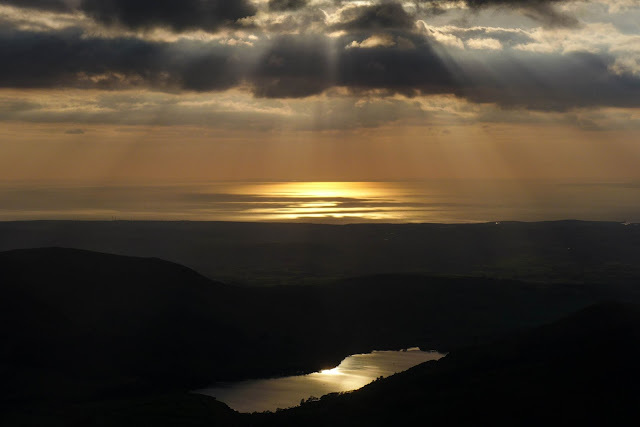 So here are 14 good reasons why the Lake District is rubbish and really not worthy of your time and effort. 1) It's always raining and blowing a gale. 2) The views are grim. 3) The locals are summit slugs. 4) The rivers are filthy. Lingmell Beck. A typical rancid Lakeland stream. The smell was offensive. 5) It's really tough walking! 6) The bridges are downright dangerous. Walk on that and it Will collapse and you Will die. Those 2 only just escaped with their lives. 8) ... and it's packed. 9) There's nothing to see. 10) It's a boring landscape. 11) The routes are uninspiring and the mountains are featureless. 12) The locals are uneducated. 13) The accommodation is pitiful. 14) I hate it .... and so does my lad. So there it is. How much more evidence is needed? If I were you i'd try the Highland's or Snowdonia. It looks far better over there. This was a route planned a good while ago and was just waiting for a favourable forecast over 2 days which coincided with my being off work. According to MWIS there was 0 % chance of rain so I opted for a bivvy & simple tarp to keep weight down. There was over 5,000 feet of ascent on this route and so I really didn't want to carry anything unnecessary. After a painfully slow (Bank Holiday week in the Lakes!) drive across the Wrynose and Hardknott passes, I parked by Cinderdale Bridge, Nether Wasdale and was underway by 1pm, hoping to get to Middle Fell with plenty of daylight to spare. 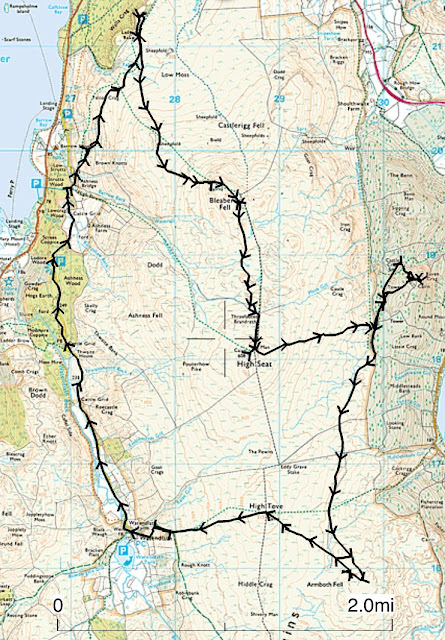 It is a mercifully gentle gradient up onto Irton Fell and then along to ridge to Whin Rigg. From here the views down to Wast Water begin to open up and indeed were truly breath-taking from certain vantage points along the way to Illgill Head. From Illgill Head summit I wandered a little further northwards and found a nice secluded spot with stunning views down to Wast Water far below. An ideal spot for a bite to eat and to just sit and soak up the majestic scenery. ... and looking down on Wasdale Head. From here, I headed down towards Lingmell Gill, after a brief diversion eastwards for a glimpse of Burnmoor Tarn. Once back down to 'lake level' there was a brief rest-bite of level walking along the road until its time to gird up the loins again in preparation for further ascent. Middle Fell looks fairly innocent when looked down on from the screes opposite but now, from Nether Beck at the shore of Wast Water, it looked ferocious. There is no marked path from this side of Middle Fell on the OS map and so I spent some time just staring up at the steep crags trying to find a line of ascent. Finally, after some internal debate about the most plausible route, I headed up. It was indeed hard work. 'Middle Fell' sounds like such a bland and innocuous proposition but this couldn't be further from the truth. A more appropriate name would be 'torment fell' or 'morale sapping fell'. Unfortunately I forgot to take a photo of the ascent but that was probably because I didn't have the nerve to prise my hands off the rock for long enough to press the shutter. Eventually I accepted defeat and convinced myself that discretion was indeed the best part of valour. 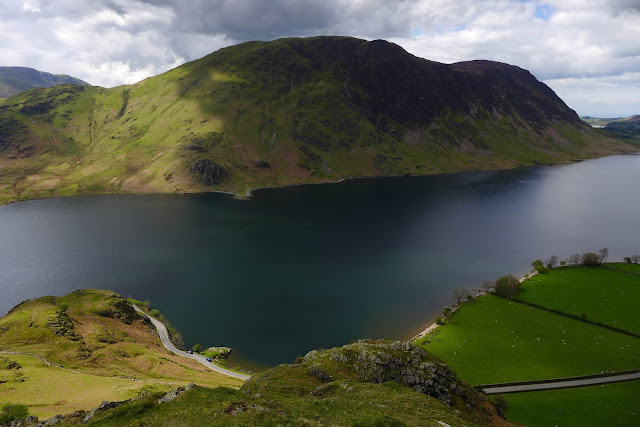 I found a nice flat grassy ledge about 2/3 of the way up, with lovely views of Wast Water, and set up camp. 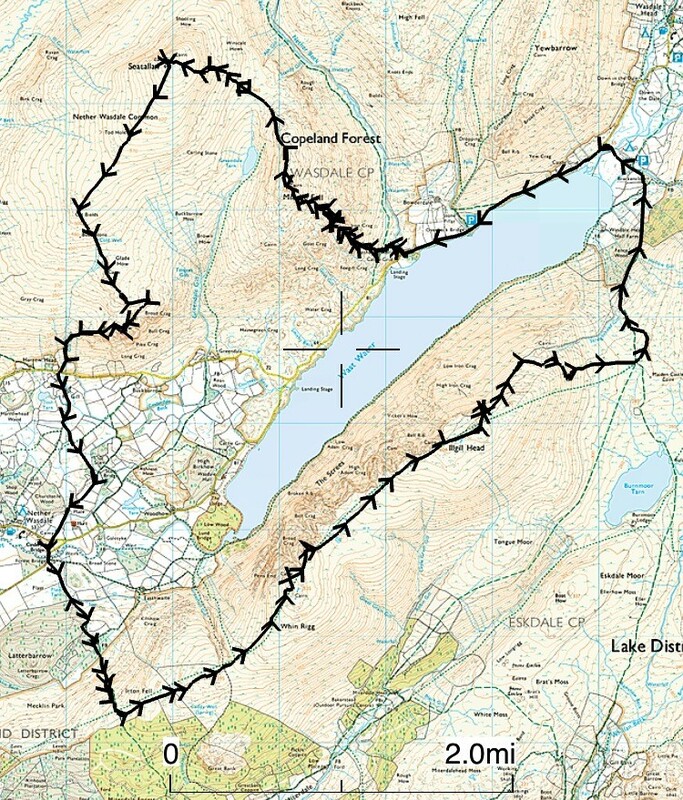 The unfinished business with Middle Fell would have to wait until the following day when my weary legs had recovered. Shortly after setting up camp it started raining. This wasn't forecast! A light drizzle persisted for 30 mins before the mist rolled in and the wind got up. I very nearly didn't take the tarp as the forecast was so benign but I was very glad of the wind protection it provided through the night. By sun-up the clag looked fairly persistent. I was camped just below the cloud base and so had hazy views down to Wast Water but visibility quickly deteriorated as soon as I gained height. Despite having 'rested legs' the remaining ascent of Middle Fell was far from easy. The pathless steep rocky terrain, poor visibility and a number a false summits made for slow progress. Eventually, the summit was reached and I couldn't see a thing. 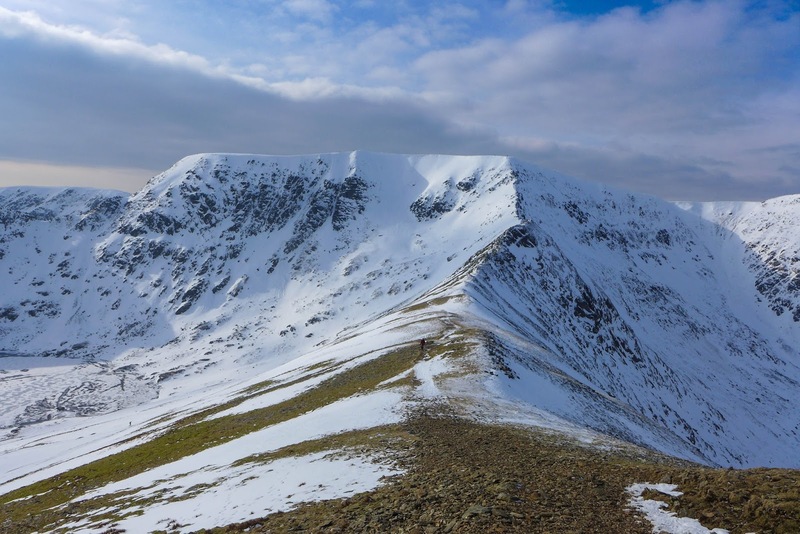 My abiding thought was that I must climb this fell again on a cool, clear day with a light day pack and then thoroughly explore the extensive crags and rocky summit plateau. A faint path leads northwards towards Seatallan. I briefly dropped below the cloud base at the col between the 2 fells but was soon in the clag again on the steep ascent up onto Seatallan's broad summit plateau. I finally got back below the cloud on the gentle descent to Buckbarrow and was rewarded with some hazy views over Wast Water to the Screes. And there ended a cracking 2 days in the fells. This really is a great route which could be managed by a fit walker in a single day over 8-10 hours. Indeed, with a light day pack, the steep ascents up Middle Fell and Seatallan would be much more enjoyable. Shelter: Backpackinglight solo tarp (278g), 6x 8 inch Easton pegs, 6x 6inch titanium skewers, 2 x 3 foot bamboo canes (tarp lifters), 6 x 5 foot lengths 2mm Dyneema cord. Sleeping System: As Tucas custom down quilt (519g), Mountain Laurel Designs Superlight Bivvy Silnylon Large (190g), Tyvek solo ground sheet (100g), Exped SynMat7 UL LW (595g), 3 strips of anti-slip matting (50g). Hydration: Deuter Streamer 2lt Bladder (185g) and 600ml Sigg bottle (100g empty) + Sawyer Squeeze filter (84g). Food: Fuizion Chiken Tikka Masala, tortilla's, Supernoodles,various sugary snacks. Bits & Bobs: headtorch and spare batteries, Iphone + Anker 5800mHh battery, victorinox knife, map & compass, basic first aid kit and Petzl e-lite, spork, various fold dry bags, flint & steel, plastic trowel, smidge & sun screen. Camera: Panasonic DMC-LX7 & lowepro case. Go-Pro Hero 5 and spare battery. Clothes: Rab interval long sleeved T (135g), Rab 100 wt fleece (250g), Montane Lightspeed windproof jacket (147g), TNF Meridian Cargo Shorts (190g), Tilley Hemp Hat, ME beany, TNF E-Tip gloves, sunglasses, Buff, Innov8 short socks. PHD wafer down jacket (about 200g), Rohan Ultra Silver long sleeved top (95g) and leggings (80g) used as pyjamas (instead of a liner - which doesn't really work in a quilt).